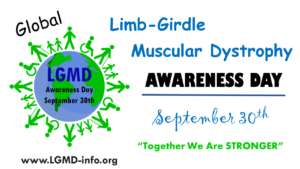 I was first diagnosed at age 6 with Limb Girdle MD. I was 40 years old when I received my correct diagnosis of Collagen 6 CMD from a free diagnostic study at the National Institutes of Health (NIH). For as long as I can remember, I thought I had LGMD, but until you have genetic diagnosis, your diagnosis isn’t complete or accurate. 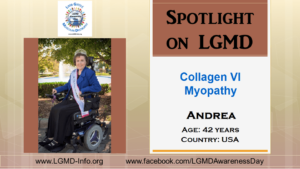 It’s common to be first diagnosed with LGMD and later determine you have COL6 CMD. As an infant, I never crawled; I scooted. Around 18 months, my head began to lean to the right, and I had very limited range of motion on that side. I was diagnosed with Torticollis and would go on to have three muscle release surgeries for it, the first at 22 months, clipping only at the center, beneath my neck. The second and third surgeries, at age 6 and 12, involved clipping the muscle behind the ear and at the base of the neck. Torticollis is common with my form of MD. I developed worsening scoliosis into my pre-teen years, had knees that turned inward, and walked slightly on my tiptoes due to contractures that prevented my legs from straightening. My arms were slightly contracted at the elbows. I kept banged up knees as a child, because I fell a lot. I also struggled to get up from the floor and had difficulty climbing stairs. My middle sister who was about six years older, Cheryl, was diagnosed with me in 1980. She was the one that donated the muscle tissue for our initial diagnosis. She passed away more than 7 years before our diagnosis was revised to COL6 CMD, however. Fatigue is a daily hurdle for me. Non-invasive ventilation via a bi-level device (Trilogy 100) and daily stretching of my breathing muscles with use of CoughAssist allows me to take deeper breaths during sleep and throughout the day. However, my body is now finding all activities of daily living more tiring. The basic things the average person takes for granted are now beginning to become consistent energy-zappers. Currently, it is impossible for me to stand up from a standard height chair without full assistance. A close second to that would be my struggle with putting socks and shoes on. I only walk indoors and do so very slowly and carefully while steadying myself with the wall and furniture. I have always adapted my surroundings and ways for doing things, so these challenges really seem more like inconveniences most days. They are my normal. My power wheelchair helps me accomplish what I need outside of my home. My greatest accomplishment would be a tie between two things. The first would be turning the tragedy of my sister’s death from respiratory failure into the organization I founded, Breathe with MD. Through Breathe with MD, I share information to help educate about breathing muscle weakness through my website (http://www.breathewithmd.org/index.html), social media (Facebook.com/BreathewithMD Twitter: @BreatheMD), and the closed Facebook group “Breathe with MD Support Group.” Breathe with MD teaches common intervention and management mistakes and equips those living with muscle-wasting disease to be advocates for their own appropriate respiratory care. Tied with that is being crowned Ms. 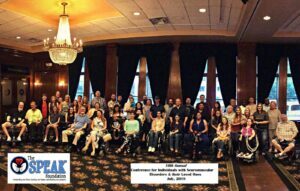 Wheelchair Tennessee 2017. My disease has helped me to be a great problem solver. I also think the progressive nature of the disease and the gradual loss of function has helped me to handle loss much better. As the disease worsens, I lose more function and grieve with each loss. It puts my life into perspective, and I don’t sweat the small stuff as much as I did when I was highly functional with my disease. I want people to understand that it can impact the breathing muscles, even when the subtype does not commonly affect breathing. It doesn’t necessarily mean that person will need to go on assisted ventilation; they could just need mechanically assisted cough (MAC) for a weak and/or ineffective cough. It’s when the disease progresses to affect the muscles in the abdominal area, it can weaken the diaphragm and its accessory muscles between the ribs. This causes the person to have limited ability to take deep breaths. Over time, this pattern of chronic shallow breathing allows the waste product of the air we breathe, Carbon Dioxide, to build to potentially dangerous levels. This always starts during sleep. When you aren’t engaging in activity that causes you to exert yourself, you aren’t allowing your body the opportunity to become short of breath. This is the primary way in which breathing muscle weakness can remain hidden to the individual for many years. The body compensates, but when the person gets a cold, their threshold may be reached, and it spirals rapidly into a respiratory infection and potentially pneumonia. At that point, they can develop a respiratory crisis that sends them to the ER. I don’t want to scare anyone, but being proactive is the proven way to avoid hospitalization and invasive ventilation. 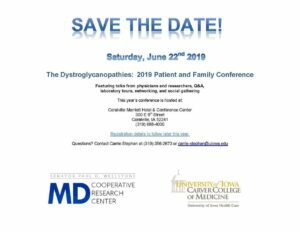 I urge everyone with any form of muscle wasting disease to get a baseline respiratory evaluation and have regular follow-up visits with a medical professional who specializes in the breathing issues of patients with neuromuscular disease. It can be scary to think about this, but there are hundreds of other patients willing to support you through this part of your journey. You can meet them in the Breath with MD Support Group. I would like to play chase with my sometimes hyper basset hound Roscoe and then walk out onto the sandbar in Sanibel Island and bend down to gather seashells.